WICKER PARK — A grand opening celebration with a mime performer, drink specials and general revelry to kick off the month of December is set for Thursday night at Fifolet Cajun, a New Orleans-style restaurant and bar in Wicker Park. Located at 1942 W. Division St., the 65-seat Fifolet opened in mid-November, after a fast turnover from predecessor Division Ale House, a sports bar which closed at the end of September. The party is scheduled for 5 p.m. to 11 p.m. Thursday, and there will be $4 select Abita beer pints, $8 house cocktails, which usually cost $10, plus $9 snifters of Abita Bourbon Street Brown Chocolate Stout, owner Baris Yuksel said. Yuksel, who operated Division The Ale House for eight years before re-concepting to Fifolet, said that effort wise, it's "easier to be a bar than a restaurant" but market wise, "there are too many sports bars and the area is saturated." "It was time to bring something new to the neighborhood," Yuksel said. So far, the biggest compliment Yuksel has received came from New Orleans natives who live in Chicago. "A lot of people who heard about Fifolet are from New Orleans and said that it's just as good as what's back at home. To us, that is our badge of honor," Yuksel said. 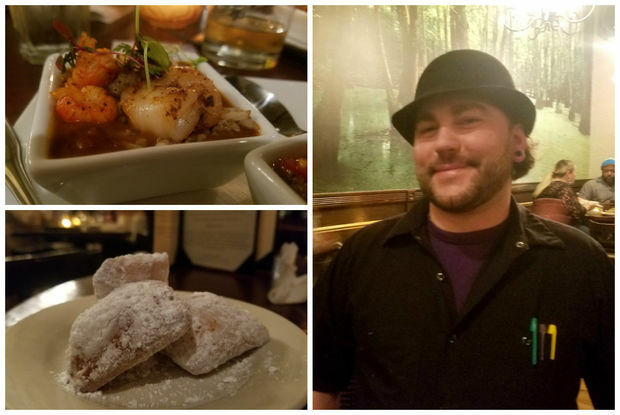 Executive chef Kevin Crouse, who says his mom has a gluten allergy, created a special "Mama's Gumbo" just so she could eat at Fifolet. Mama’s Gumbo" is made with filé, duck, chicken and andouille and is gluten and shellfish free, while "Gumbo Fifolet" is made with dark roux, shrimp, crawfish, house made alligator sausage and okra. Read Crouse and chef de cuisine Corey Gillom's menu. According to Cajun folklore, a fifolet (pronounced fee-foe-lay) is "an eerie burning light" that is seen often in the swamp and beckons all to follow. Some treasure hunters also believe that following a fifolet will lead to treasure. Fifolet, 1942 W. Division St., Hours are 5 p.m. to 2 a.m. daily. Kitchen is open from 5 to 11 p.m. Sunday through Thursday and through midnight on Friday and Saturdays. Ph: 773-384-6886.